Tips to How to Survive a Bridal Show… Again|Triad Wedding Planner|Katrina McCullum | Bringing It All Together With MOH!! You are engaged and you are ready to go to your first (or fourth) bridal show. You may be going to find all or some of your vendors or to get some great ideas or just going for the prizes. What ever your reason, here are a few tips on how to survive any bridal show. Where comfortable shoes- There is A LOT of walking involved. Don’t be the first to arrive- Many bridal shows give out the really great prizes and giveaways at the end of the show…so you are once you have visited all the vendors you are kinda just standing around waiting. Print out labels- Everyone wants you to fill out a form. Print out your name, address, email address, wedding date and phone number on a address sticker, this way you can just stick it and keep it moving. Create a “wedding” email- You are going to be overwhelmed with emails regarding your wedding. 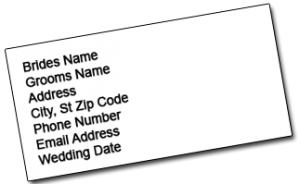 So not to get it mixed up with your personal or business email address; create one just for your wedding, this way you have all the information in once place. Focus only on the vendors you need- If you know you , you already have your invitations there is no need to speak to this type of vendor. No need to fill out their information form and no need to make them feel as if you are interested in their services. Bring your entourage- Divide and conquer is the key, especially if it is a really big show. Give everyone a sheet of labels. Instruct them to be honest of who they are and gather information so you can cover more ground in less time. Enjoy your self- You are a bride, enjoy the attention. You will state your wedding date a least a million times. Don’t get upset everyone is excited for you. Eat samples, participate, and relax. Keep the business cards separate from the bridal bag they give you once you arrive. There will be so much information in that bag it will be easy to loose track. So tuck it in your purse, back pocket or keep them in your hand as long as they are separated. 9. Ask first, but take pictures of the vendor booths that particularly catch your interest. This entry was posted in Bridal Shows and tagged Bridal Shows, Wedding Tips by Made of Honor Weddings. Bookmark the permalink. Great tips!! The adress label idea is genius! Love the idea of asking first and then taking photos of vendor booths that interest you. It helps jog the memory after seeing and meeting hundreds of vendors at once.